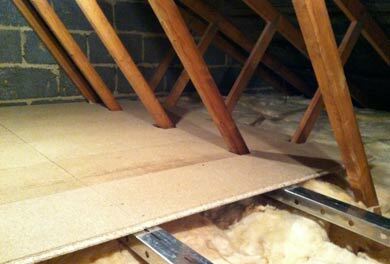 The best way to lay a floor in your loft for storage is to lay floor board panels. We show you how to lay out tongue and groove loft boards in your loft supporting them on joists for a secure storage floor. Loft boards, loft panels and loft flooring in the loft or attic must only be done to store items such as empty suitcases. Unless your loft or attic has been converted, it is not designed to carry loads heavier than this. The horizontal rafter, or ceiling joist timbers in your loft are there purely to hold up the ceiling below, not carry weights beyond normal domestic storage items. When your house was built, the upstairs ceiling, which obviously forms the loft floor, was designed to be able to carry 25kg per square metre. A 10 stone human being weighs 64kg. Conclusion, lofts are not designed for parties! There are parts of normal lofts which (before the popularity of combination boilers grew) are strengthened to hold water tanks for the normal domestic cold water and sometimes a header, or feed and expansion tank for the central heating. You will see that in any part of the loft where there is, for example, a water tank, the floor is reinforced and, in a lot of cases, the rafters are given additional support by hanging timbers attached to the pitched section of the trusses. If you mean to convert your loft into living accommodation of some kind (please note, even using it as an office or study counts as living accommodation) then you need to find out if you need planning permission from your local Council. You will certainly need Building Regulation approval to convert your loft into anything other than a storage space. Please also read our projects on loft conversions and building regulations. As above, where for loft flooring or loft storage, the ceiling or loft floor is designed to carry only 25kg per square metre. A floor in a loft conversion must be designed to carry a minimum of 150kg per square m. This is 5 times more than a loft used for storage on loft boards or loft panels. Clearly to achieve this greater load bearing capacity, stronger (usually larger) timbers have to be placed in the roof. It is essential that weight of any consequence in a loft is transferred to a support which in turn takes that weight right down to the foundations. This is usually done by either adding additional support beams to reduce the span of the existing timbers, or simply enlarging the timbers which sit on the load bearing walls on either side, or either end of the property. You can find out more about load bearing walls and safe floor joist spans in this project page. Loft boards and tongue and grooved loft boarding panels can be bought from most DIY sheds and builders merchants. 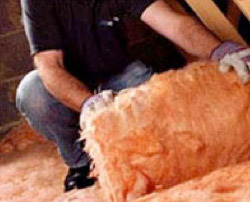 Read our project on loft insulation to make sure you have enough insulation in your loft or attic before fixing down floorboards. Building Regulations have recommended an increase in depth of loft insulation to make sure you do not lose too much energy from your house. As loft insulation should not be squashed down, this means raising the height of your loft floor and this can be done in a number of ways. Our preferred method is to use a kit which lifts the floorboards up from the joists enough to get a good amount of insulation down but still allow a good ventilation flow to avoid condensation. You can find out more about this kit by checking out our project on fitting loft storage boards over 270mm of insulation. To put a floor in your loft is not a difficult job. It is made much easier by the production of special loft panel flooring. These panels are 18mm thick, 1.2m long and only 320mm wide. This means they are easy to get through the loft hatch. They come in packs of 3 or 5 usually and a pack of 3 is enough to cover a little over 1 square metre. You must make sure you do not lay the floor right up to the edge (eaves) of the floor space as air must be allowed to circulate in the loft to avoid condensation. The loft boards or loft panels have tongue and grooved sides and ends. This allows one board to be slotted into the one next to it giving it greater strength over any length of floor not supported directly by floor or ceiling joists. 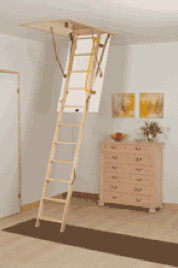 Firstly, if you are intending to use the loft a lot for storage it is as well to fit a loft ladder. You may well have to enlarge your loft hatch to do so, so take a look at our project page on enlarging a loft hatch. To buy a loft ladder just click on the image on the left and you will be taken to a selection of loft ladders which should be ideal to get you in and out of your loft safely. In the majority of cases lofts are dirty and very dusty. All the dust in the air seeps through the tiles and roofing felt joints to settle on your ceiling. Add to that the dust created by old insulation and you have a pretty unhealthy environment. 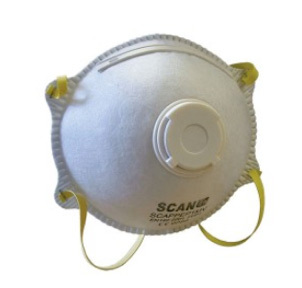 Make sure you can breathe properly in the loft by using a filter mask and, where there are fibres from insulation flying around where you have disturbed the loft insulation you might want to wear some eye protection. The long sides of the loft boards should be laid at 90 degrees to the joists and the ends of every board should always meet on a ceiling or floor joist. All fixings to the joists or rafters should be done by screwing the panels down. This avoids the vibration caused by hammering nails through the loft flooring into the joists or rafters below. This vibration can weaken the fixings used on the plasterboard forming the ceiling below and the joints can crack. 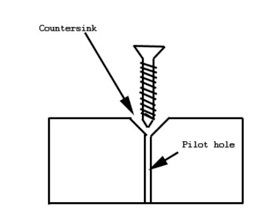 Screws should be counter-sunk into the loft boards to avoid them sticking up above the surface of the boards. If this happens they can catch on expensive suitcases, or other stored items, and cause a great deal of damage which is not noticed until you drag the bag out of the loft again to take on holiday. It is very rare for the loft boards to meet naturally on a joist. In the best-case scenario the joists will be perfectly parallel to one another and laid at exactly the same centres every time. This however does not mean that the end of a loft board will “land” on a joist. 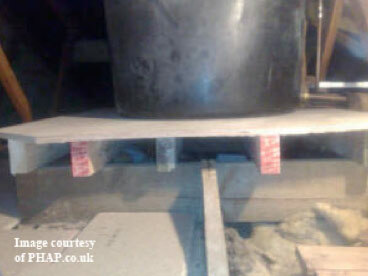 In the worst-case scenario the joists will not be parallel and will have been laid at differing centres. 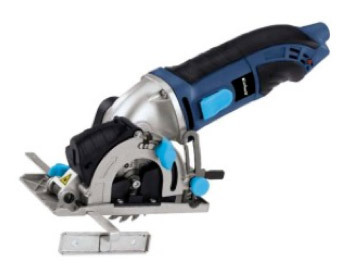 There is always a lot of cutting involved in laying a loft floor and its a great idea to buy a mini circular saw to save you a huge amount of time and effort. 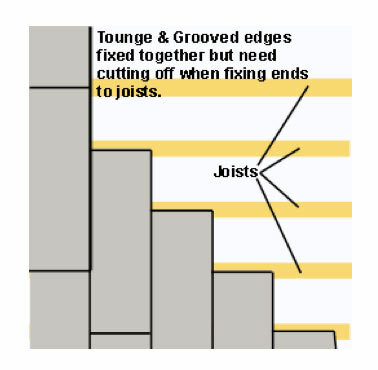 Normally a board has to be cut so it finishes in the middle of the joist as shown in the above diagram. This means of course that the tongue and groove need to be cut off both boards where they meet. This does not matter as the joint will be very strong when it sits on the joist. Do not be tempted to join boards between joists as they will soon sag and cause a weak spot in the floor. As mentioned, each screw should be countersunk and a pilot hole drilled. This makes fixing the boards easier and takes the heads of the screws below the level of the floor so when you slide suitcases along the floor they do not catch and tear on the screws. Another good reason for using pilot holes is so the boards do not split when you screw them close to the edge. Why not take a look in our DIY Superstore where you can buy the insulation and loft boarding systems you need to carry out a really successful and neat loft storage project. Once your loft is boarded out properly you will be able to, with the correct access and lighting, store and remove all your suitcases and other storage boxes easily, quickly and, most importantly, Safely. Good luck with your loft boarding and storage project.